A nasty little germ has been running rampant around New Jersey lately. That germ is a virus named Coxsackie. And last week, that virus found me. Chill out with the dirty jokes: the odd name of the virus comes from the Hudson River town where it was first discovered in the 1940s — Coxsackie, New York — about 90 miles north of New Jersey. Coxsackie is better known as hand, foot, and mouth disease. It is completely unrelated to foot and mouth disease (also known as hoof and mouth disease) that exclusively affects livestock. If you or a family member have had Coxsackie, you know all about it. If not, you've probably never heard of it. I figured it would be helpful to share my Coxsackie experience and what I learned, especially since I keep hearing from New Jerseyans who have suffered from Coxsackie recently. Feel free to share your own story in the comments below. According to the Centers for Disease Control and Prevention (CDC), Coxsackie occurs far more often in children than adults. And supposedly, just like chicken pox, the symptoms can be far more severe for the unlucky adults who contract the illness. According to the state Department of Health, it's most often seen in summer and early fall. (Getting sick in the summer is no fun at all!) The state warns pregnant women should seek medical advice if they come down with it. Last year, about 20 students at Princeton came down with the disease — a big spike from the single case the year before. • Around Wednesday afternoon, I started experiencing initial symptoms including sore throat, fever, and general discomfort. They came on very suddenly — within a few hours, I went from feeling fine to feeling not-fine-at-all. • Thursday's fever was the highest, around 103 degrees, and I spent the entire day in bed. Rest, cold compresses, and lots of water and Gatorade. 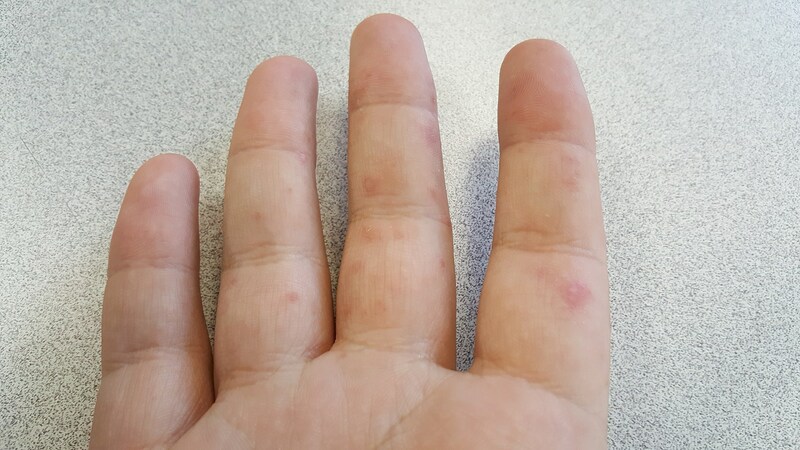 • On Friday morning, the fever finally broke for good, and I started developing the characteristic sores in my mouth and blisters/rash on my hands and feet (Hence the name Hand, Foot, and Mouth Disease). • Through Saturday and Sunday, I felt better physically. But because of the sores, swallowing was difficult at times. I stuck to small bites of soft, non-spicy, non-salty foods. Meanwhile, my hands and feet got progressively itchier and somewhat painful. Coxsackie is a virus, so antibiotics won't do a thing. In fact, with no cure or specific medication to treat the disease, the best you can do is treat the symptoms, get plenty of rest and stay hydrated. My doctor did prescribe "magic mouthwash," a lidocaine-based cocktail that numbed my mouth sores to make swallowing, eating, and talking somewhat easier and less painful. As I write this, I'm happy to report that I'm now feeling great! I still have about a half-dozen ulcerated canker sores in my mouth that are quite annoying and pretty painful. That's in addition to a few bothersome blisters on my palms, fingers, toes, and the soles of my feet. Certainly not debilitating, and I'm confident that I'm no longer contagious. I'm lucky to have contracted a pretty mild case of the disease. Serious complications can develop for adults (and children too) if not treated properly or because of other aggravating circumstances. Coxsackie is spread from person to person through coughing and sneezing, or through contact with blister fluid or feces of an infected person (yuck.) The CDC recommends the usual common-sense steps to limit your risk of being infected: regular hand-washing, use of disinfectant, and avoiding close contact with infected people. To my family, friends, and co-workers ... I'm sorry if I accidentally infected you with hand, foot, and mouth disease. Let me know the instant you feel feverish and sore, and I'll rush over a bowl of chicken soup and some Gatorade!